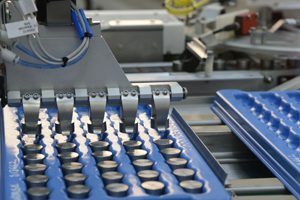 Innomech has developed a new high speed automated product packaging system that will help SG Technologies – a global leader in the production of high performance magnetic components – to more than double the production capacity for one of its highest volume products. The new system has been designed to automate a particularly labour-intensive and repetitive product packaging process for a series of components that are used within automotive fuel injectors. The new fully customised system gives SG Technologies the option to increase production throughput for this product line by 150%, while also improving its manufacturing process efficiency and reducing work in progress. It also means the company’s skilled operators can focus on more varied and challenging manufacturing tasks such as short production runs of highly specialised parts.